Get ready for shabbat with this fun new weekly enrichment program. 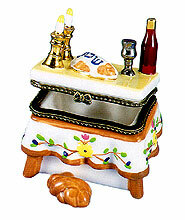 Create your own Shabbat Box and fill it up with your very own special Shabbat treats. Shabbat in a box kids club features cooking, crafting, songs and a whole bunch of Shabbat fun! . Learn how to make grape juice, challah, and matzo ball soup. Bring the shabbat spirit into your home with your very own handcrafted kiddush cup, challah cover and candlesticks all in it's own special shabbat box. Connect to your roots and learn a traditional shabbat song each week. You don't have to be a super-Jew to join in, this is perfect way to add some Jewish culture into your child’s life! .